Recycle Brevard designs projects to target waste reduction and foster sustainable living. The main goal is to raise awareness through hands-on, meaningful activities to support positive changes in certain community, no matter how big or small. 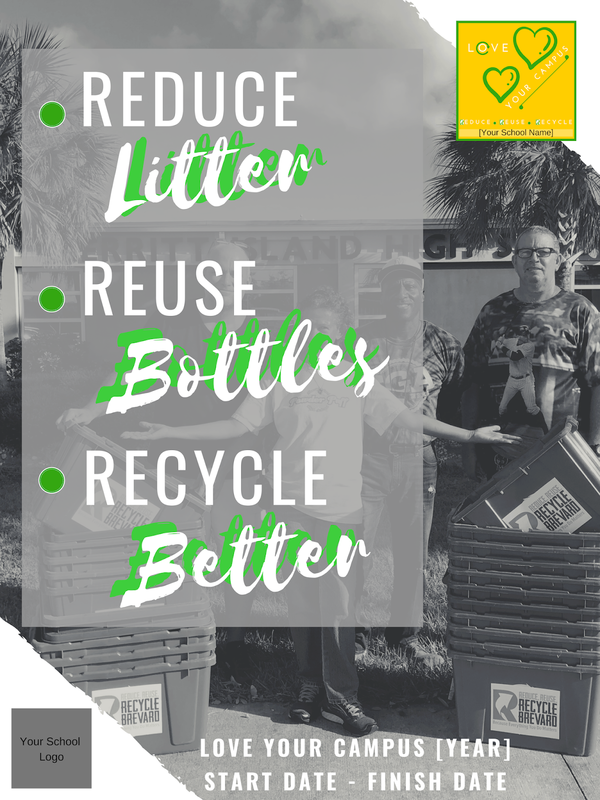 Recycle Brevard also partners with other organizations to increase the reach of already existing projects, either by sharing what we developed to be expanded to other areas or by implementing and supporting locally what was developed by others. Waste Me Not projects are community projects that connect what we do with why we do it. Our Waste Me Not Recycled Art Show represents the reflection side of the projects. After we work on a project, we should take some time to think about the impact we are making, and how that will affect the problem we are trying to solve or the deficiency we are looking to correct. We want to get to the point that the art show is end piece of community projects done by participants. We will be working with our partners and expanding our partnerships to further develop this connection in our future art shows. Contact us if you would like to receive further information on this. Projects to help divert as much material as possible from the landfills. Raising awareness and supporting sustainability and the environment through community projects. We invite you to support our efforts to increase the practice of the 3Rs - Reduce, Reuse, Recycle through any of these projects. 😳 Each year 100,000 marine animals and over 1 million sea birds die from ingesting plastic. 😳 Every day we use 500,000,000 plastic straws. That’s enough straws to fill 46,400 large school buses PER YEAR! 😳 U.S. Consumption is equal to enough plastic straws to wrap around the earth’s circumference 2.5 times a day! If you would like to reduce plastics in the environment, join us to say "NO" to plastic straws. County, Florida the OneLessStraw pledge and campaign as one of our efforts to reduce plastic pollution and cut down single-use plastics. OneMoreGeneration has over 100 global partners joining us in this campaign. Once signed, send your pledge form to Recycle Brevard via email or snail mail. This is a simple way to become aware and get started in the journey of reducing plastics in our environment. It takes practice and some habit changing to become part of the solution to reduce plastic pollution. Thank you for participating! The best way to tackle plastic pollution is by reducing the amount of plastic we produce and use. Solutions may not be easy to find or to implement, but many are already doing so - and that is great news! 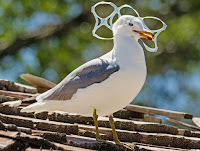 However, we need a solution for the plastics already in use and by making the 6-Pack Ring Recycling Program available to Brevard County residents, Recycle Brevard hopes to reduce the amount of plastic in the environment. 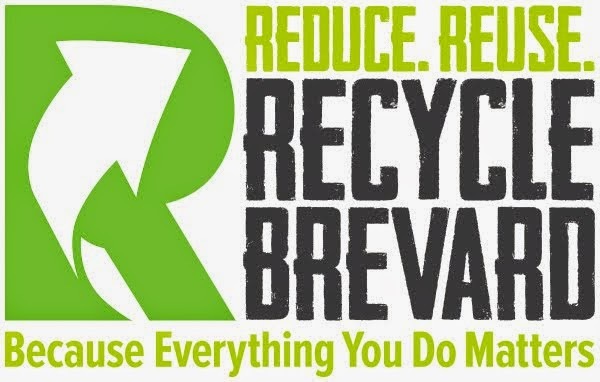 This is a FREE recycling program and a community service provided by Recycle Brevard. NO compensation is received from this program. Anyone - individuals, groups, schools, organizations, or businesses - is welcome to participate. To participate, you may choose to DROP OFF your plastic 6-pack rings AT OUR FACILITY or register online to have access to free shipping labels to ship them yourself. 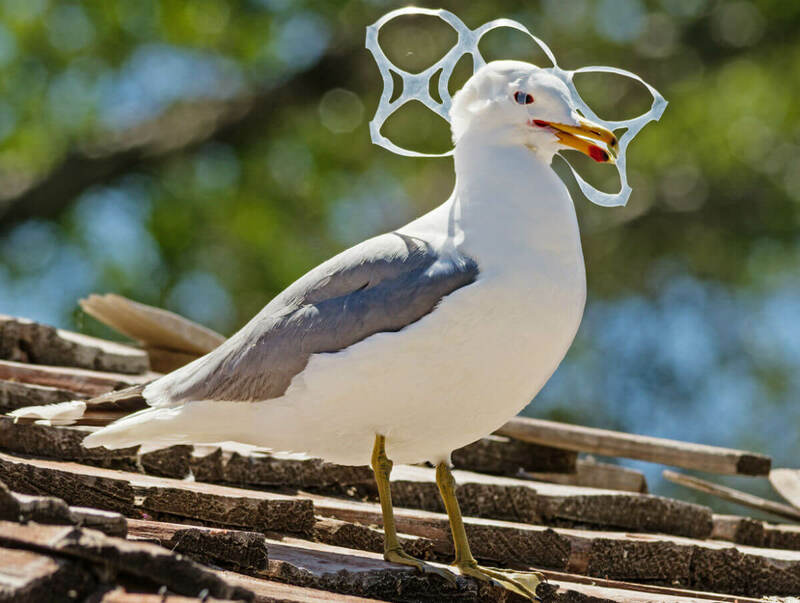 Once you're registered, collect plastic packaging rings of any number of rings - 4, 6, 8 or 12 - from beer or soda or any beverage and use a regular cardboard box to save them in. Once the box is full, print the label, ship it out, and start collecting again! Love To Recycle - Batteries was started in February 2019 with the goal of offering free alkaline (non-rechargeable) battery recycling to the community and recycle at least 500 pounds of alkaline batteries. We are seeking sponsors to help us purchase battery recycling boxes. Each box holds about 50 pounds of battery and costs $65. We are very thankful to everyone who has been able to donate to make this project a reality. We hope we can gather more donations and also find a BUSINESS PARTNER interested in sponsoring some boxes. In appreciation for their sponsorship, we would be happy to display their name/logo on the boxes they sponsor and have some of their marketing material at our location. We can also consider preparing boxes and having sponsors host or place boxes at some other location of their choosing. We will coordinate details in this case. Once we acquire boxes, we will make them available to the community at our facility so everyone can recycle their batteries for FREE. The more funds we raise, the more batteries we will be able to recycle. If you would like to participate in this project, you may donate any amount to this fundraiser. Whether you donate $5 or $500, every little bit helps. With the focus on the three Rs, we have been working with Merritt Island High School (MIHS) to Reduce Litter, Reuse Bottles and Recycle Better. MIHS Students, teachers and staff have been working together to improve in all three areas. The campaign was launched on February 1, 2019 and ran until March 1, 2019. 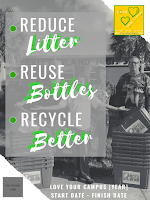 Recycle Brevard would like to support other teachers and schools who are looking to make reducing and recycling better in Brevard. Read MIHS story and follow-up report. If your school is interested in our Love Your Campus campaign, please contact us. Our #GivingTuesday project was launched in November 2018. 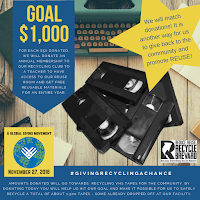 Aiming to raise funds to purchase boxes to recycle VHS tapes - 1,500 of them - and donate Recycling Club memberships to school teachers. 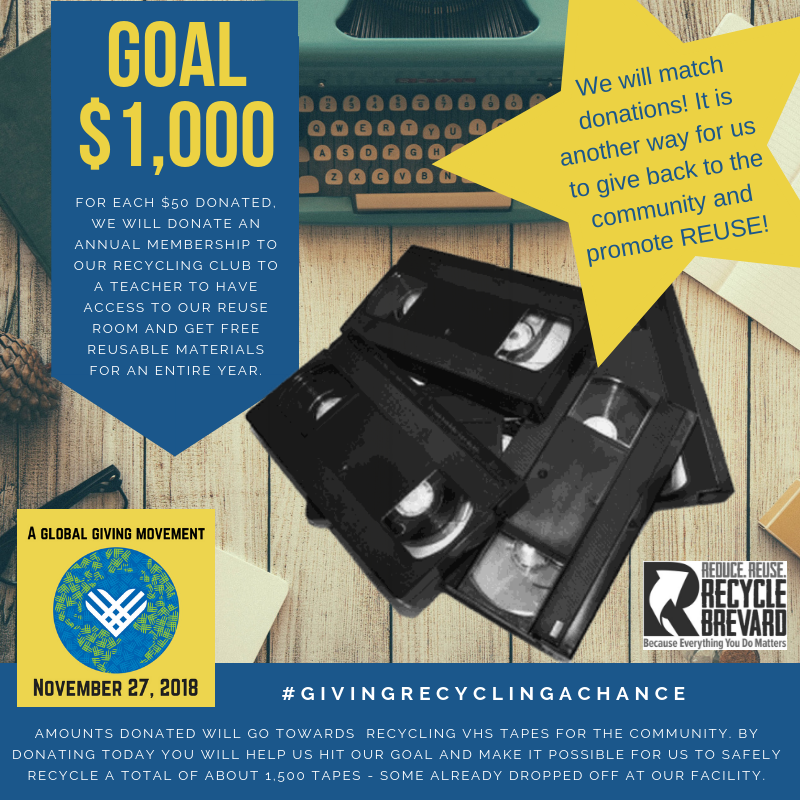 Thanks to our supporters, we were able to purchase 10 boxes and are working to achieve our goal of recycling about 1,500 VHS tapes. From the ten boxes purchased for #GivingRecyclingAChance we were able to fill up and ship five of them. Those contained 536 VHS tapes for recycling and were shipped on February 5, 2019. Box number 6, holding 107 VHS tapes, was sealed on March 12 ready to be sent out for recycling. Box number 7 already has 9 tapes in. If you have any VHS tapes to recycle, make sure to drop them off at our facility. We will be accepting tapes until we run out of boxes. Thank you to all who donated toward this project! If you haven't done it yet, please nominate teachers that you think would like to have access to reusable materials to receive a FREE annual membership in our Recycling Club. As part of our matching program, we will select 16 teachers to receive a free membership. We would like to see 16 schools benefiting from this. To submit your nomination, fill out our online form. It will just take a few seconds. Thank you! Litterati is an app to collect litter data to help identify problem areas and the most commonly found brands and products. This data will be used to work with companies and organizations to find more sustainable solutions. Download Litterati and join the Brevard Against Litter club. Litterati Clubs are dedicated to cleaning the planet. Brevard Against Litter is a local club created as a joint effort between I Pick Up Litter and Recycle Brevard. Help collect data for this worldwide movement of picking up litter! The goal is to reduce what gets in our waterways, while identifying problem areas, the types of products that need the most attention as well as the manufacturers/source of the litter. Our Past Projects helped us toward our main goal of getting the word out. If you have ideas for other projects, please contact us at Info@RecycleBrevard.org. We would like to hear them!